Carla prepares to march with the band during her first football game. Minutes before finally meeting my family I felt overwhelmed. I didn’t know what to expect. But when I saw my wonderful new family waiting for me at the airport, my nervousness turned to relief and happiness. My exchange year had finally begun! I haven’t gotten homesick at all, because I’m always busy. I’m part of the marching band at school, and that is definitely the most amazing experience so far! 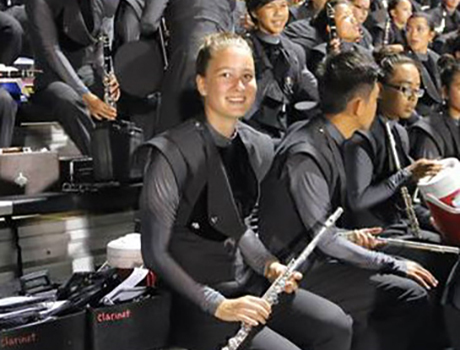 Through the marching band, I have met a lot of great people, survived our three-week-long band camp, and learned how to overcome my weaker self. And even though it takes my whole free time to be a part of this “huge family,” I enjoy every second of it. I already had two football game half-time performances. And what can I say? It was amazing, and I’m really excited about my next 10 months here in Texas!